Hi yall! Im back and had a great time. 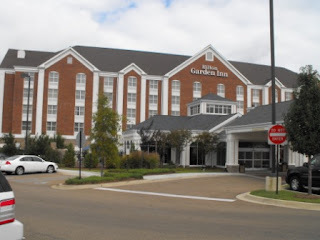 We stayed in Madison Mississippi...cutest town around! This was our home away from home....Nice! 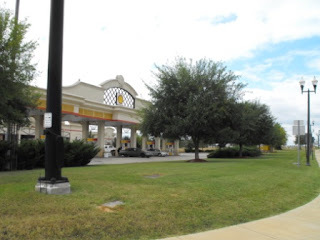 Im telling yall... this town was so cute and neat even the Shell gas station was cute! 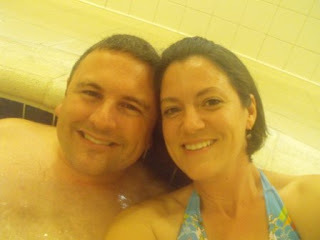 This was Marc and I acting goofy in the hot tub. Most of the good pictures were all fogged up, hehe. 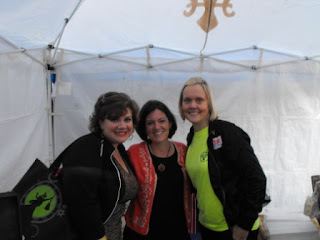 What made my day was when I got to meet some of my precious bloggin' friends. This was Karen from thepromotedprincess. I was able to meet her and her adorable Mom... I know this has to be the worst picture of me in the history of pictures. I just had to share it anyway cause look at how cute Karen is! She and her mom....SWEET! Then to make it even sweeter I met two more of my friends. Cena from unexpectednecessties and her friend. The day just couldnt get better! 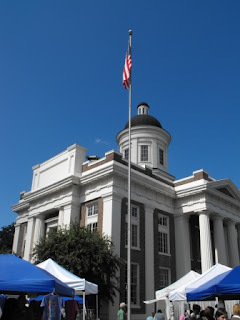 I couldnt really walk around and take pictures cause we were so busy but here is the courthouse where we were. If my trip wasnt great enough... look what was waiting for me when I got home. Miss Sara sent me a "sweet suprise" and boy was it sweet. 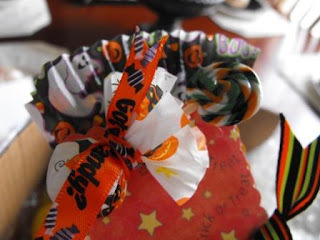 Just look at this adorable little trick or treat pin! 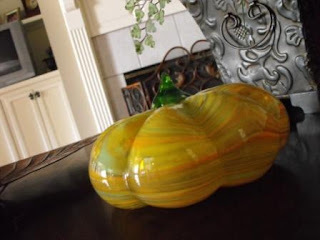 Oh and this beautiful pumpkin! Thank you so much Sara! So gal's it was a great weekend. The only thing I wish I could have done that I didnt get to was shop at Canton with my sister, neice and Terry. That looks like a totally charming town. I'm going to put it on my list for the day when my husband and I take our road trip of small town main streets! I am so happy to hear that you had such a successful show! It looks like it was great fun to meet some blogging friends and just hanging out with hubby too. Then to have a great surprise waiting for you at home as well. Have to say, I love that Welcome sign you have in the photos. Welcome Home!! I'm so glad your show was such a success!! 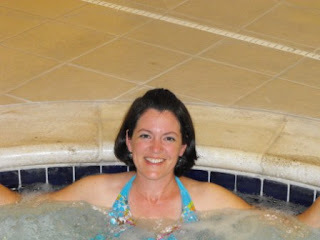 Looks like your down time was wonderful in the hot tub too! Isn't a surprise waiting for you always fun?!? I usually go to Canton, but this weekend we went to Gulf Shores for another family event! I hope you are there in the spring...it would be fun to meet you! Your photos are great...and I'm so glad you had a successful show. Glad you had a successful show, looks like you had a very fun weekend! Madison is a lovely little town. I lived there from '92 to 2002. But, as you can imagine, very clique-ish, too. Thanks for stopping by my blog. I would love to know that paint color you used when you changed out your bright white. Do you happen to recall the name and brand? Thanks! Glad you had a great show!!! It looked wonderful! So glad that your show went well! Looks like a great time away, too, with your hubby ;)! Hi Susie! I'm glad your show was a success. What a cute town, I'm glad you had a good trip. You two are so cute! Glad your weekend was successful! Congrats on a succesful show. You sure do have beautiful stuff. What a great weekend! I'm glad everything went so well. How fun you got to meet a few bloggers!! You may not know that in Madison, is'a law that all new construction must be brick on the outside. That's why the town is so cute! I live a few miles away from there. If I'd known you were at the flea market, I might've gone! Sounds like your were busy but also had a great time relaxing with hubby! So neat to meet blogging friends. 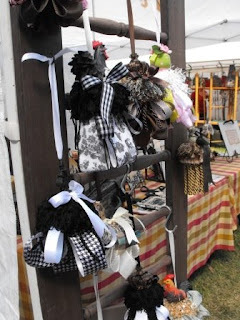 Love your display of tassels and soon I am going to get one..Hopefully after the hoildays! Those are so awesome! 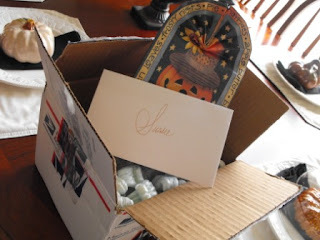 Love the goodies you received also! Come do a show in St. Louis please!!! Hooray! You had a great time. I'm so happy for you! So glad you had a great trip. I know you were a big hit!!! Everyone is at home right now loving the goodies they got from your show! I'm glad your show was successful! I told my daughter-in-law and her mother to look for you. They never miss a Canton show. What a cute town! Glad you had fun and sold lots! Glad everything went well, you have awesome stuff. I'm glad you had a great weekend. sounds like a grand ol time! congrats on having to restock! 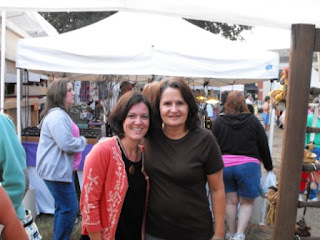 How sweet to get to meet some blogging buddies!! You look gorgeous as always!! Glad you're back! That is great. Nice photos and neat stuff. Susie, Mom and I had such a nice visit with you and hubby. Thanks for the sweet comment. Glad you had a great day in Canton. Susie, I am so glad it went well. I had to miss it and was so sad. We had a friend from back home call and ask if she and her kids could drop by for lunch. We rarely get old friends come by. So I couldn't say no. Anyway, there is always May. Since you did so good, I know you will be back.LOL That court house at Christmas is unbelievable. I hope to get a great Christmas picture there of my kiddos. Again, I'm glad it all went great!!! 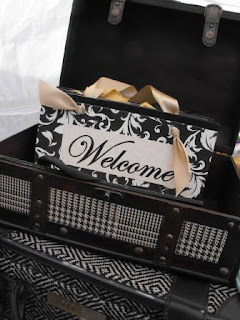 What a gorgeous Welcome sign. Do you have a shop online? I love your tassels and signs. You are so talented! Iam not surprised you had such a great show.